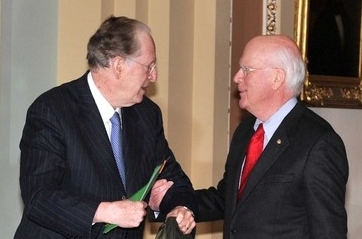 Despite 410 House votes for and none against, unanimous passage out of the Senate Judiciary Committee, and the support of 99 other senators, the office of Senator Jay Rockefeller (D-WV) has placed a hold on the FOIA Improvement Act. If passed, the Act would limit the oft-abused “predecisional” exemption Five, increase the independence of the Freedom of Information Act Ombuds office (Senator Chuck Grassley once threatened to drive his car to the Office of Management and Budget to force the release of a blocked FOIA Ombuds recommendations), force agencies to update their FOIA regulations to comply with the law, establish a council of Chief FOIA Officers, and more. When open government advocates first heard of the last minute hold placed on the FOIA bill by Rockefeller’s office, we were surprised. Other Senators (some still unreported) had placed holds, but relayed their concerns to the office of Senator Leahy, which smoothed out possible misunderstandings, and secured their support. Rockefeller’s office, on the other hand, was largely incommunicado. Despite Senator Reid and Leahy’s call the Senate to pass the bill on Thursday night, Rockefeller’s office maintained radio silence. His twitter feed began to explode, not with congratulations for his thirty years of service, but with questions over why his last act was blocking such important, bipartisan legislation that would benefit the public. While disappointing, Senator Rockefeller’s inaccessibility and inability to resolve his hold on the FOIA Improvement Act may be explainable. Earlier on Thursday, he gave his final floor speech in the Senate ( urging the Senate to “embrace our opportunity to lead, to listen, to dig in, to bridge differences, to govern – to truly make a difference.”) His staff watched, and then celebrated thirty years of public service with the Senator and his wife, likely unaware of the controversy the hold had generated. Still, his hold stirred a storm. “Jay Rockefeller placed a hold on the FOIA bill? !” is the confused response I’ve heard several times these few days. The irony is that Rockefeller’s abrupt, ill-considered hold has distracted from celebrating his protection of Americans, and instead has muddied the end of his legacy. Fortunately, the drafters of these twin House and Senate FOIA bills, working for the past two years, also care deeply about protecting consumers from financial fraud and other abuses. The anonymous “experts across the federal government” that the statement dubiously cites are dead wrong. According to Toby McIntosh at Freedominfo.org one agency encouraging Rockefeller to obstruct the FOIA bill is the Federal Trade Commission. 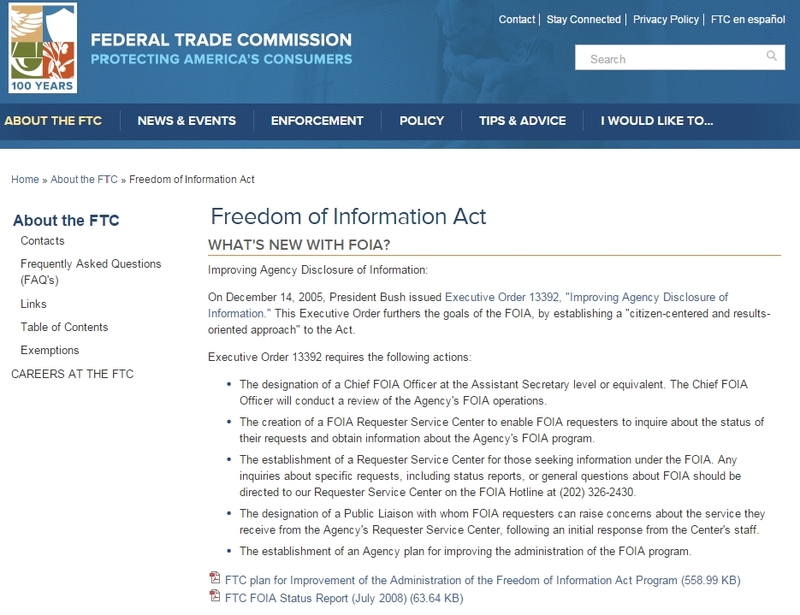 The “What’s New” section of the FTC’s FOIA page lists a 2005 George W. Bush Executive Order. Perhaps the FTC is not the best agency to consult on FOIA issues. Senator Rockefeller is expressing a concern raised by the FTC that under the bill, information protected by attorney client privilege and deliberative process could lose its protection. This fear is completely unfounded. Courts have long recognized the importance of protecting agency information created during a deliberative process, including that protected by attorney client privilege and attorney work product. This bill does nothing to alter that long standing protection before the 25 year mark. This bill would require agencies, when using a discretionary exemption, to find a foreseeable harm if the information is released. Agencies have been required to use this standard since 2009 when Attorney General Holder issued a memo requiring it. Agencies also used this same standard during President Clinton’s term. It was only during President George W. Bush’s term of secrecy that this standard was rolled back. Sen. Rockefeller also expressed concern that the changes “would potentially give defendants new ways to obstruct and delay investigations into their conduct.” There is nothing in this legislation that provides defendants ways to obstruct or delay investigations. Senator Rockefeller also wrote that “I hope there is a way to address these concerns and pass the bill.” There is. I’m certain that when Senator Leahy is able to sit down with Senator Rockefeller over a beer and pepperoni roll and explain that the bill was carefully crafted not to undercut current oversight or to allow for the impediment of investigations, the Senior Senator from West Virginia will walk away enthusiastically supporting the bill. There is also, of course, the option of including report language clearly stating that no information properly protected by attorney client privilege and deliberative process will lose its protection. Old FOIA pros have told me that similar reporting language was successfully included in previous bills to secure passage. Ultimately, Senator Rockefeller’s three decades of championing citizens over powerful interests, forging Senatorial consensus, and previous support of the Freedom of Information Act have convinced me that after thoroughly analyzing the amended bill –and speaking with Senator Leahy to ensure his concerns over unintended consequences are addressed– that the Senator will lift his hold and add one final moral and legislative win to his already impressive legacy.